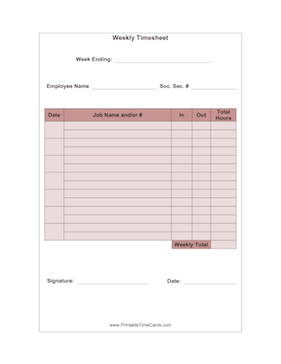 This simple weekly time card includes columns for a job name and/or number, an in/out period, and total hours. This Time Card is available in two versions: a free, ready-to-use version and a $7.00 editable version. The $7.00 version can be edited. It is compatible with Microsoft Word, Google Docs, and any other word processing app that's compatible with the Microsoft Word .DOC format. The editable version can be customized with your information: company name, employee name and number, etc. You can pay using your PayPal account or credit card. You'll be able to download the customizable time card within moments. If you don't see a time card design or category that you want, please take a moment to let us know what you are looking for.